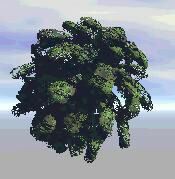 Use this tutorial as a basis for creating your trees and bushes, you can probably do better that I did with these meager attempts. 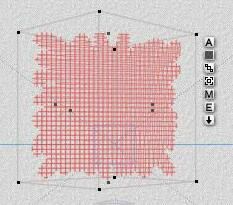 With the lattice selected, click on the arrow next to Edit and choose the ‘Foliage’ material, then click on the check mark to accept. Leave the default settings in the canvas. 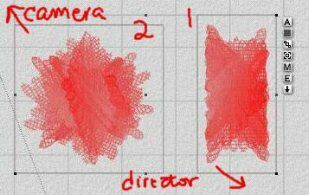 Move the brush into a corner and left-click 3 or 4 times. Move over a little and repeat. 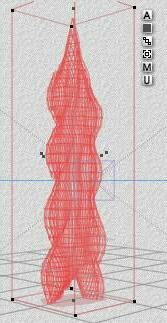 Continue moving the mouse and painting on the canvas, varying the amount of clicks until you have something that looks like this. Do not make the diameter of the terrain too round or it will look unnatural. 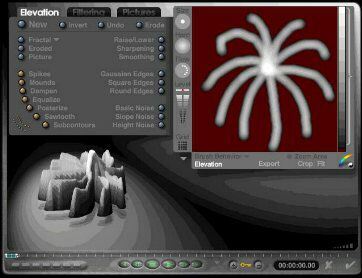 Click on the check mark to accept the terrain and return to the wireframe view. 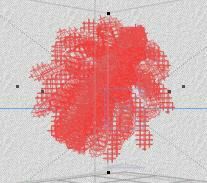 Here is the finished lattice in the wireframe view. Click on the ‘A’ button next to the lattice to open the properties sheet. First, rename the lattice so you can find it as you add to your image. Change the y-size to 30 and Apply. Then keep adjusting the y-size until you are happy. Now rotate it -90 on the x-axis and 45 on the y-axis. Here’s a quick render (no anti-aliasing) of the lattice. 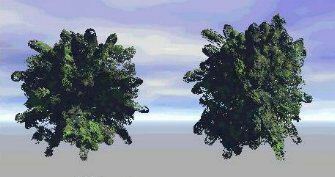 With the bush selected, duplicate it, then move it slightly to the left or right, rotating and adjusting placement until it looks like a bush. 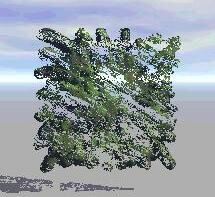 Here’s a quick render (no anti-aliasing) of the lattices. 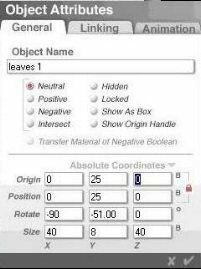 Adjust again if needed, then select both lattices, group and rename (I like to name individual object in all small letters and finished grouped objects with initial or all caps). 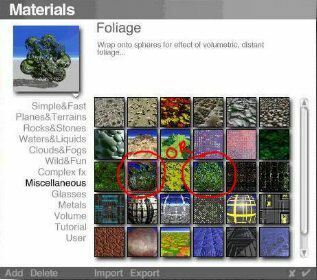 Add the bush to your Create palette to use later. 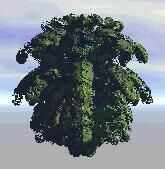 Here I’ve duplicated and resized the bush to show you what can be done with it. And here they are quick rendered (no anti-aliasing). 9/19/99 – Something I just thought of, you could put a bunch of these together and build a tree. 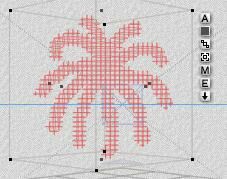 Resize the brush to the smallest possible, then draw a shape that looks like a palm tree top or fireworks display. 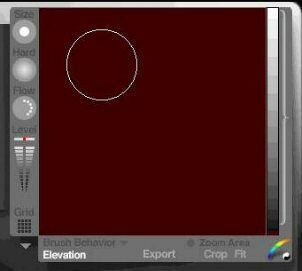 Lower the color level and flatten out the center of the terrain. 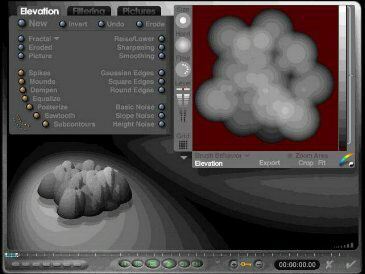 Click on the check mark to accept the terrain and return to the wireframe view. Click on the ‘A’ next to the lattice and rename, resize, and rotate as shown. 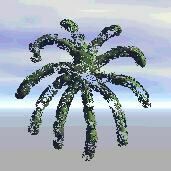 Here’s the ‘palm tree’ terrain in wireframe view after the resize and rotate. 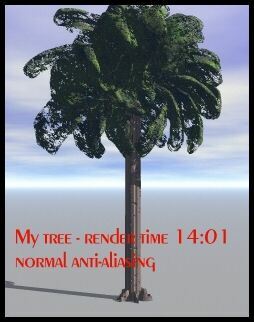 Here is a quick render (no anti-aliasing). 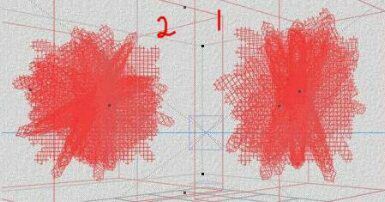 Multi-replicate the lattice using the following settings. 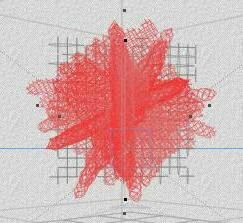 Here is the result in wireframe view. And as a quick render. Notice that all the ‘branches’ are very symmetrical. 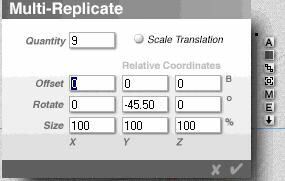 Let’s try out another mult-replication. Select the original lattice (or delete the previous replicates. 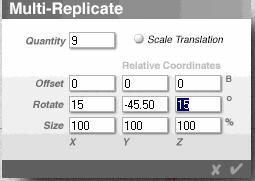 Choose multi-replicate again, and enter the following values. Here it is in wireframe view. And as a quick render. Looks more natural, doesn’t it? Another variation on the palm tree starts with the color level a little lower than shown, paints in some branches, raises the color level, adds in more branches, etc. Don’t go too high on the color level and don’t lower the terrain here. 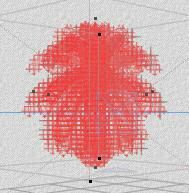 Here is the lattice in wireframe view after being rotated and resized. Here it is quick rendered. 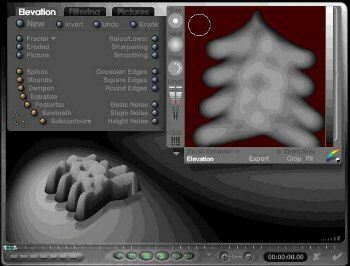 The wireframe 1 is my first tree done this way and wireframe 2 is the one done for this tutorial. This is the view from top (I rearranged them for easier viewing). I had mult-replicated too much and in too small increments so it was huge. Since I only needed to see it from one side, I tabbed to each lattice and deleted any that looked like they overlapped another one. 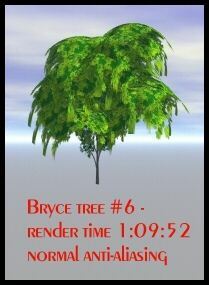 For the trunk, I added one from one of my Bryce cds. 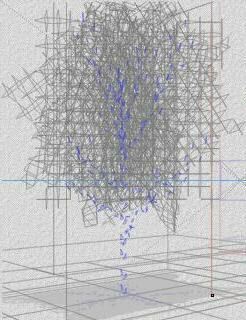 You can see it in blue in the wireframe view. Now for another variation. What do you think this ends up looking like? 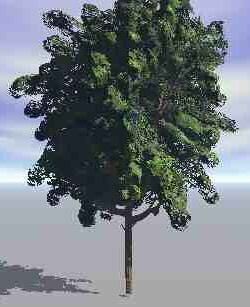 Well if you stretch it and squish it in, then duplicate and offset the duplicate, you get an ornamental tree. Neat, isn’t it? !